Please note BuildBlock is providing information on Cactus Board, but it is not a product we sell. Please visit their website for product and pricing information. 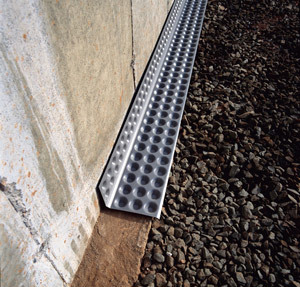 The CactusBoard and CactusBoard II drainage system uses a molding to create a space between the foundation floor and walls, as well as between the floor and footing. Any water that might leak from the windows, cracks in the walls, or from the footing/wall joint will drain into the stone aggregate underneath the floor, and finally into a sump pump or daylight drain, and most importantly, out of the house. An important part of the drainage system is the sump pump, which ultimately pumps the water away from the foundation. The TotalSump package is a complete solution for installing a fully-functioning sump pump; and includes a reliable 1/3 hp pump and mechanical float switch, all the screws and bolts, inline check valve, a rigid liner, and an airtight lid that prevents debris from getting in and clogging the pump. What Makes the CactusBoard Drainage System Different? The CactusBoard foundation footing/wall drainage system is guaranteed to keep the basement floor dry. We’re so confident about this, the foundation waterproofing product comes with a transferable 20-year Dry Basement Floor Warranty. Homeowners will love this because they can be confident that they will never have to spend more money waterproofing the foundation floor. CactusBoard is being used by waterproofers all across the country to make sure the foundation floors they waterproof stay dry. Our warranted drainage system that’s guaranteed to work the first time saves you a lot of time and money and creates repeat customers! Builders will come back to you whenever they need foundation waterproofing because they know that the results will satisfy the homeowner, which means fewer headaches for them too. CactusBoard is a winning solution for the homeowner, the builder, and the waterproofer! Visit http://www.cactusboard.com for ordering information.